An audiologist is a professional who specializes in the diagnosis and treatment of hearing and balance disorders.Audiologists can work in a variety of specialties such as private practice, hospitals, schools, and research facilities.Audiologists are university trained and hold either a Masters or Doctorate degree.Following thorough diagnostic testing, audiologists can treat hearing loss by fitting hearing aids and treat balance disorders with vestibular rehabilitation. The ear is comprised of three main areas; the outer ear, the middle ear, and the inner ear.Sound travels through each structure and eventually to the brainstem where it is sent to various areas in the brain for processing. The outer ear consists of the pinna (external ear structure) and the ear canal.The Pinna is naturally designed to gather and send predominantly high frequency sounds down into the ear canal.The ear canal then directs the sound toward the eardrum (tympanic membrane). The middle ear consists of the eardrum, the ossicles (three little bones), and the air filled cavity, which exists behind the eardrum.Sound travels through these structures by vibrating the eardrum that in turn vibrates the ossicles and ends at the oval window of the inner ear. The oval window is a thin membrane at the entrance of the inner ear that contains all of the tiny hair cells inside a structure called the cochlea.The cochlea is a fluid (similar to hydraulic fluid) filled structure, which is snail shaped and houses approximately 18000 hair cells that receive different parts of the sound signal individually.Because the cochlea is fluid filled, the sound vibrations entering at the oval window send vibrations throughout the entire structure and stimulate the appropriate cells based on the frequency of the incoming sound.From the cochlea, the sound is transmitted down the 8th cranial nerve and into the brainstem. There are three types of hearing loss; sensorineural, conductive, and mixed hearing loss. Sensorineural hearing loss is the most common type of hearing loss and is caused by a loss of sensitivity at the hair cell level in the inner ear structures.This type of loss is most commonly the result of the aging process (called presbycusis).Other causes of this loss are excessive noise exposure, idiopathic hearing loss, and familial hearing loss.Sensorineural hearing loss is not correctible through surgery or medications and is generally treated with the fitting of hearing aids. Conductive hearing loss is the result of a defect in the outer or middle ear structures.Causes can be from wax blockage in the ear canal, ear infections, or otoschlerosis (ossification of the ossicles).Conductive hearing loss is generally treatable with surgery or medications.If an audiologist diagnoses you with conductive loss, you will most likely be referred to an Ear Nose and Throat physician for treatment.Hearing aids are fit on conductive hearing loss only when other treatments are not deemed effective or necessary. The third type of hearing loss is a mixture of sensorineural and conductive loss and is simply called mixed hearing loss.Any combination of sensorineural deficit and a conductive component is considered a mixed loss.Treatment for this type of loss is complex and may need medical intervention and the fitting of hearing aids. 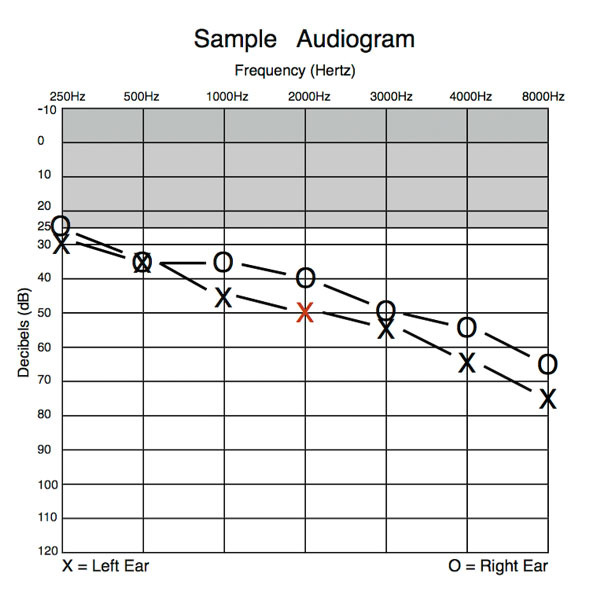 The graph below is a copy of a hearing test (Audiogram) that reveals high frequency hearing loss.If you keep this in mind while the rest is explained it will help in the learning process.First, let’s understand the underlying graph which is common to all audiograms.On the left vertical axis there are numbers ranging from -10 to 120.These numbers are sound levels and are measured in decibels.The higher the number is, the louder the sound.The top, horizontal axis shows numbers ranging from 250 – 8000 representing different frequencies (these are measured in Hertz).Frequency is much like pitch.Imagine the keyboard on a piano.Pounding the keys on the left will create very deep, bassy sounds.Those are low frequencies.On the right of the piano are the tinny, shrill or high frequency sounds.We test these frequencies because they are the most important for understanding speech. O.K., let’s take a look at one of the symbols in the middle of the chart.If you look at the top numbers and find 2000Hz, go down to the X (highlighted in red).Now follow the X in a straight line to the left.Do you see the corresponding decibel level of this X?It’s 50dB.What this means is that at 2000Hz, this patient heard the softest tone at 50dB.Any tone louder than that is audible and any tone softer than 50dB is inaudible.We have now established that the threshold at 2000Hz is 50dB.Now you can look at every frequency and figure out what the thresholds are.By establishing all of the thresholds across the board, we can get a good idea of the overall hearing threshold as it relates to speech by using some of the educational shaded areas on the audiogram. At the top of the audiogram, there is a shaded rectangular area.This area represents normal hearing, which is any threshold that is 25dB or better (less).If all of the thresholds lie within this area, it is considered normal hearing.Adversely, any threshold falling outside of this upper shaded area is considered hearing loss. There is another shaded area that is shaped much like a banana.This area represents what researchers have classified as the speech banana.If you broke apart the English language into all of the individual sounds we make and plotted them on the audiogram, based on their frequencies and volume, they would all fall into this area.Therefore, if your threshold line cuts off any of this shaded area, you are not able to hear some aspects of speech. You have probably figured this out by now, but here are a few general statements about interpreting this chart. • The further down the thresholds are, the worse the hearing loss. • Anything lower than the upper shaded area is significant hearing loss. • When the hearing threshold cuts off any portion of the speech range, hearing aids are recommended. • The hearing loss represented is a mild sloping to severe, high frequency hearing loss. Please visit this link for a more detailed description about understanding your audiogram.